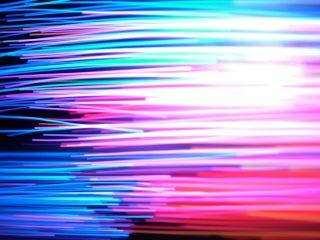 Scientists have developed a new type of optical fibre that should speed up processing, cut power consumption and boost bandwidth in future computers. Researchers at Clemson University in South Carolina have made the first fibre-optical cable with a silicon core using mass-production techniques. Optical fibres carry an increasing proportion of phone calls, TV shows and internet traffic. The main advantage of using optical fibres over old-fashioned copper cabling is much higher bandwidth. Despite not being transparent, crystalline silicon actually carries signals much better than today's glass fibre-optics at some wavelengths. Silicon also allows for the amplification of light, and shifting it from one wavelength to another. This opens the door to using silicon optical fibres in signal processing functions that are currently done electronically or in separate optical circuits, meaning more compact, efficient electronic gadgets. The ability to produce silicon fibers commercially would create the opportunity for more compact devices with decreased power consumption in telecommunications and beyond. Clemson Uni boffins reckon the technology could be made commercially viable within just a few years.